Any flight delay, change of effective arrival and/or check in day have to be PROMPTLY communicated to our desk by email and/or by phone. Please read carefully : a valid mobile number and/or an effective time needed compulsory. Only valid credit cards accepted (no debit cards)to guarantee the reservation ( it have to be possible a remote check of the card to preauthorize the first night stay mount . in case of deny we cannot keep as garancy and the reservation will be cxl immediately. All bedrooms are elegantly furnished with rich curtains and quilts and provided with a warmed-up bathroom with bathtub and shower , a tv, a box safe and a desk.All rooms are provided with air-conditioning. Thanks to its strategic position, from the Guesthouse you can easily reach all the main touristic sites, both on foot and by bus. We are flexible from 18:00 pm till 20:30 applying an extra payment of E. 20,00 as a flat amount due for the late check-in. From first of January 2011, all non resident citizens have to pay the Rome journey tax so please keep in mind will be asked an extra charge of e. 3,50 euro per pax, per day. A great place to stay during our time in Rome. Everything we needed for a very reasonable price. Just to clear up some confusion from previous reviews, this property is NOT a hostel/dormitory, but more so a boutique hotel. You couldn’t ask for a better location. The hotel is located in the heart of Monte. You can walk everywhere. Colosseum is 10 minutes away and all the fabulous bars and restaurants are minutes from the hotel. It was very comfortable, clean and quiet. The owner is professional, friendly and helpful. His staff is efficient and thorough. Great little place. I’ll be back! Lucca was a fabulous host. He and his employee Jerry went above and beyond to make our stay comfortable. Highly recommend! The owner communicated the check in times with us in advance and made sure the room was ready for us. He gave us all instructions on getting in and out of the property. Room was very comfortable, cleaning staff comes every day to keep the property and it is very close to everything. Would highly recommend this place. Owner or manager was extremely nice and accommodating to us, but did not seem very nice to his staff. The staff do an excellent job. The place was clean and easy for us to get to from the train station. go to the La Nazionale Gelateria nearby - so delicious! 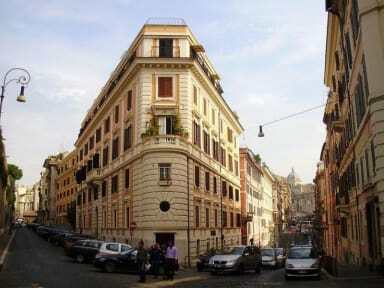 It was a good place to stay while sightseeing in Rome. We walked everywhere. The rooms were clean and the air conditioning was nice. We stayed in the front room so in the morning we could hear everything in the hallway which was annoying. It was an okay place to sleep. No one at front desk, close to everything. Just real small and on your own sorta.